At age 32, I got the shock of my life, when I was told I needed heart surgery. After, surgery, Cardiac Rehab helped me regain my strength and confidence. I even lost 15 kg in three months. Mr.Satchid Sargaonka,. Age 32 Bypass surgery on 15 september,2004. I had an angiography with one 100% blockage and was adviced surgery. However, My cardiac surgeon advised Cardiac Rehab. At first I thought it was a gym,but then realized that exercise was only one component and the overall emphasis was on complete health and cardiac care. Mr.Rajendra Jhaveri, Age53.Angiography on 24 August,2003. After enrolling in Cardiac Rehab I have experienced much better control of my blood sugar and blood pressure. I lead a normal life as if nothing has ever happened to my heart. Mrs. Villy Elavia,Age 64.Angioplasty on 18 July,2003. After bypass surgery I was very scared to undertake any exertion due to advanced age and low pumping capacity of my heart (EF was 25%), but now I feel young again and am able to walk more than an hour daily and took part in the Mumbai Marathon 2005. Mr. Ramesh Bhimani, Age 76.Bypass surgery on 24 December,2003. Cardiac rehabilitation is a multi-dimensional program designed for those who suffer from heart disease. The program reduces their future risk through medical evaluation, prescribed exercise, cardiac risk factor modification, education and counseling. A heart attack or an intervention procedure such as bypass surgery or angioplasty is a consequence of heart disease. After the event, it is crucial to keep your risk factors to a minimum, to keep your arteries free of blockage, which is the main aim of the program. Patients are eligible to join the program one to four weeks after discharge, depending on their medical condition. Is Cardiac Rehab right for me? How will this help me? Studies have shown that Cardiac Rehabilitation significantly reduces the risk of future death and complications of heart disease. The focus of the program is not just on exercise, but to change your lifestyle and risk factors to achieve a long and healthy life, free of heart disease. Will my doctor be involved? Your personal physician and cardiologist are an integral part of your care and will be informed about your progress. They will also be involved in any decision affecting your medical care. 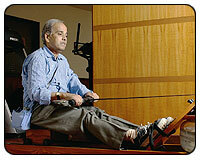 This begins in the hospital following a heart attack, heart surgery or angioplasty. Low level physical activity begins in the ICU itself and is gradually increased during the stay in hospital. Education on cardiac risk factors is initiated and the patient is advised appropriate lifestyle modification. 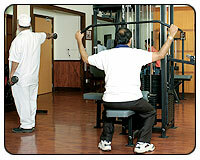 The patient attends the program 3 times a week at the Rehabilitation Center. 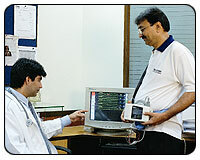 During each session the patient exercises using state-of-the-art portable heart monitoring equipment, known as telemetry. This ensures optimal amount of exercise in the safest manner possible. An individualized program of lifestyle modification, including in-depth nutrition counseling is planned. All of the patients risk factors are monitored, and kept under strict control. 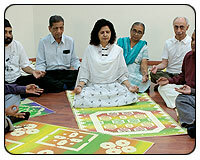 Patients are also introduced to Yoga meditation techniques. The duration of the program is between one and three months, depending on the medical condition. This begins on completion of Phase II, once the patient is more independent. The focus continues on education and lifestyle modification and risk reduction. 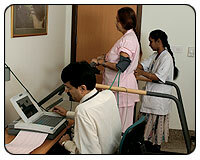 Exercise is performed under supervision, and telemetry is used if indicated. In addition to the above, indiasurgerytour.com represented hospitals regularly conduct week-end camps, designed to help those who are unable to attend our regular programs. The goal is to introduce the patient to various risk reduction methods, which they can then follow on their own.